Avon Tyres have released a new sport touring tyre, called the Spirit ST, which replaces the British firm's Storm 3D range. The new tyre has been designed to provide high levels of wet grip together with high performance handling on a wide range of sport-touring bikes. The Spirit ST uses the latest high-silica synthetic rubber compounds to increase the mileage of the tyre, which has been designated as a hypersport touring tyre. The Spirit ST is built around an all-new carcass design that focuses on high performance handling and stability. 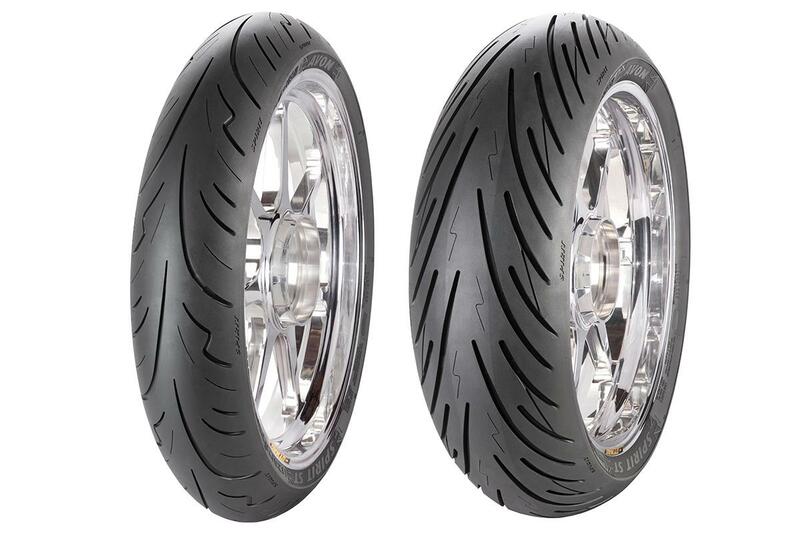 The rear tyre features multi-compound tread more prolonged life, while the edges use a softer compound for improved grip. Avon say the new tread pattern means the Spirit ST is able to move more water than ever before while maintaining its operating temperature over a wide range of conditions. You may have noticed the smaller sipes, on the tyres. Avon have given these sipes interlocking 'teeth', which they say eliminates the vague 'squirming' feeling felt on some older tyres and helps the tyres warm up fast. For more info visit www.avon-tyres.co.uk.